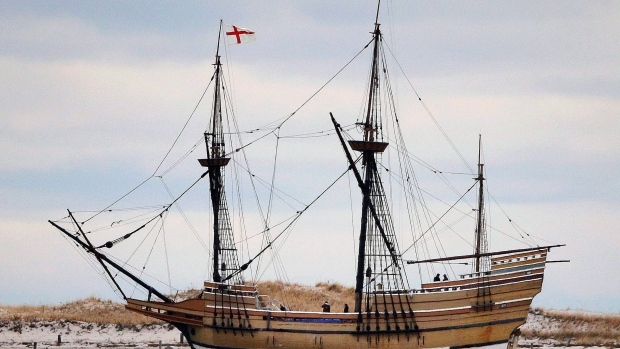 FILE - In this Dec. 12, 2014 file photo, the Mayflower II, a replica of the original ship that brought Pilgrims to Massachusetts in 1620, passes a jetty as it is towed out of Plymouth Harbor in Plymouth, Mass. BOSTON -- A months-long effort to digitize the authenticated genealogies of Mayflower passengers has been completed, making it easier for people to determine if they are descended from a Pilgrim. The New England Historic Genealogical Society announced Wednesday that the Pilgrim database project launched last year with the co-operation of the General Society of Mayflower Descendants includes 193,000 birth, baptism, marriage, deeds, death, and burial records of 50 of the 51 Pilgrims known to have descendants.